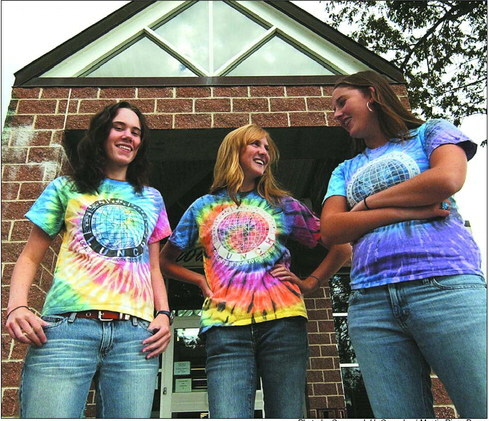 Katie Castagno, Maggie Luckhardt, and Mackenzie Robert chat while waiting to have their picture taken at Wheeler High School. The girls, who are all in eleventh grade, are wearing LUNCH T-shirts. N. STONINGTON – Local students are gearing up to help fight hunger. A Hunger Awareness Concert is sched­uled for October with pro­ceeds benefiting local social service agencies. It is being sponsored by the Students in Action Committee at Wheeler High School and partnered with the LUNCH Ensemble. LUNCH, an acronym for local united network to com­bat hunger, created by state troubadour Bill Pere, is a group founded in 1989. It is now made up of profession­als from the Connecticut Songwriters Association and about 30 students from fifth to 12th grades, in Connecticut and Rhode Island. Performing throughout Connecticut and Rhode Island, LUNCH partners with various schools and churches to perform con­certs to benefit social serv­ice organizations. To date they have raised $700,000 and have involved more than 2,000 kids to show them the difference they can make in the lives of others. Carrying on the legacy of singer-songwriter Harry Chapin, they perform his songs and believe in his desire to help those in need. The October concert is the first in the series that are scheduled to be performed throughout the school year ending at the Shubert Theatre in New Haven in June with the original Chapin Band. Wheeler High students Maggie Luckhardt and Mackenzie Robert have designed posters for the benefit. The two students are the SIA members coor­dinating the concert. The primary social serv­ice agency to benefit from the proceeds is the Pawcatuck Neighborhood center, according to Gisele Buehler, who is involved with promoting the event. Others in the area will receive some proceeds as well. 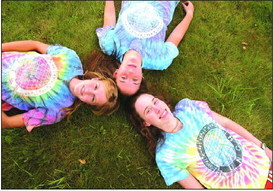 Maggie Luckhardt, Mackenzie Robert and Katie Castagno 'put their heads together' at Wheeler High School. “I think it’s wonderful of Bill Pere to make us one of the beneficiaries of the concert proceeds,” said Vicki Anderson, executive direc­tor of the center. Pere was on the original Hunger Task Force aimed at educating the public that people are “food insecure,” 365 days a year, not just during the holidays. The term “food insecure” refers to not being certain where one’s next meal is coming from. More than 900 clients are served by the Pawcatuck Neighborhood Center, and they are primarily working families, said Anderson. She describes this involve­ment with the concert as “an enormous help.” “It’s a local problem with a local solution. We can’t do it without the help of the community,” said Anderson. Buehler got involved when her daughter Anna became interested in doing some community service and found a venue that enabled her to make use of her musical talent as well. “The students from all areas tend to take an inter­est in LUNCH because they can see the direct benefit to the community and they stay because it’s so much fun,” said Buehler. Katie Castagno, a junior at Wheeler High School, has been involved with LUNCH since she was in the eighth grade. “It’s a great program for a great cause,” said Castagno. “I really hope the concert will raise an awareness of hunger and homelessness, especially in North Stonington where people don’t realize what it means to be hungry, especially the kids. We want to get the message out there.” The concert is being held in the Gymatorium at Wheeler High School on Route 2, on Oct. 20 from 6 to 9 p.m. Tickets are $10 for adults, $5 for kids, and $25 per family. Tickets can be purchased in advance by contacting any SIA repre­sentatives at Wheeler High, or the Choral Director Holly Schmidt. Maggie Luckhardt, Mackenzie Robert and Katie Castagno up a tree behind Wheeler High School. The girls, who are all in eleventh grade, are wearing LUNCH T-shirts.